A wide range of sizes! PONY 4" 4" 4.5" 5" 5.5" 6"
These are stainless steel Coronet bits. The brand is well recognized as durable and well-finished. Our eggbutt bits have flat rings, a 14 mm. 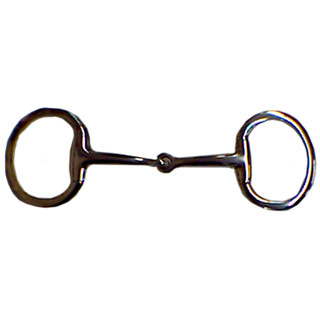 single joint snaffle mouth and a smooth finish. We know how difficult it can be for customers to find just the right size bit for their horse. So, we carry a very good range of sizes. Sizes PONY4 through HORSE6.